Recently, I started my first semester of my masters degree in music. One of my classes this semester is called Music Analysis for Performers, and we had an interesting discussion regarding our decision to pursue a music career. That class and discussion got me thinking about why I am where I am. Why did I leave my full time job to pursue a masters in music? What do I want out of this experience? To be honest, I don’t have the best answer. I love music, and I love sharing that passion with others. Music is one of my biggest passions and strengths. The other passion and strength is writing. (Can’t you tell?) Music has been a part of my life for as long as I can remember. Growing up, I played a ton of different instruments before settling on flute in high school. I don’t have the typical background of a graduate music student, and that’s okay. I also don’t have the same career goals as many graduate music students. 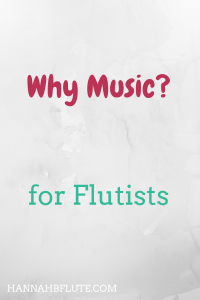 Yes, I am a flute performance major, but I want to do more than just perform. I want to teach (online or in person), write ebooks and method books, and of course I want to perform. Going back to school for music was a hard decision to make, but I think it’s what I need right now. While I might not have a normal music career, I know that I can’t see myself doing anything else. A career in music isn’t easy, but a lot of career fields aren’t easy. I’m not saying that every band kid should become a musician, but it is possible to major in music and create a career. I recently took an online course on creating my dream career, and that course has given me the skills to create the perfect career for me. The internet has made it much easier for musicians to build their own careers, assuming they have the necessary skills. You can’t just be good at your instrument anymore. Luckily, there are plenty of ways to make a career in music. I’m also a freelance writer, and I publish my own blogs each week. As a musician, you have to wear a lot of hats. You have to search for work, maintain your schedule, and keep up with your music. I took a year and a half off from school to figure out my goals. I didn’t want to jump into a masters degree without a good reason. Over the past year and a half, I learned how important a masters is to many classical musicians. You can make it as a musician without a degree, but a masters opens up many opportunities. A masters degree gives you two more years as a student, and you can soak up that much more knowledge about music. Continuing your education also means you’re serious about a career in music. While a bachelors in music isn’t easy, a masters goes a step further. Taking those two extra years to advance your skills shows potential colleagues that you mean business. If you want to teach private lessons, a masters degree will give you extra credibility, and you can charge more. As long as you can afford it, a masters of music is a great way to advance your skills and potential as a professional musician. If you’re considering a career in music, you need to know that it isn’t easy. A degree in music isn’t isn’t band and choir. You have to take music theory and ear training, group piano, applied lessons, and all of the general education courses that you school requires. Some people will say that if you have any other interest, you should pursue that and not music. I don’t necessarily agree with that, but the reasoning makes sense. Music is hard, and you have to be dedicated enough to make it work. There will be times when you question everything, and you have to rely on your love of music to keep you going. You can make a career in music, but you have to be willing to work for it. Are you a professional (or aspiring professional) musician? Why did you choose to pursue a career in music? Let me know in the comments!